Another early morning for a wonderful day trip. 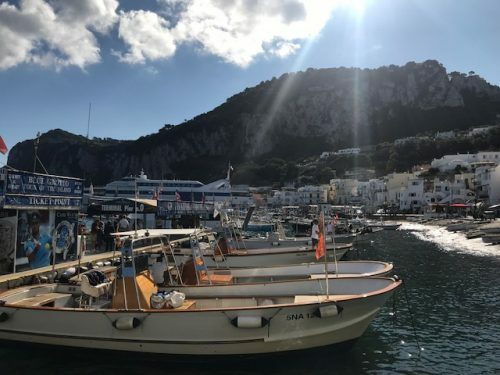 Capri was on the top of everybody’s list of places to visit, so naturally we booked a last-minute train and ferry to the island. Coming in to the island by ferry offered a stunning view of the rocky cliffs and sparkling waters. I grew up spending summers on the East Coast, so I was extremely happy to be close to the water again. I wished there was a sailboat I could rent for cheap to get out on the water! We got there by 10am, and the place was already a hub of activity. There were buildings climbing their way up the steep hillside, and taxis with open roofs and small motor scooters weaved in and out between tourists. The first view of the port we had. The port area is full of boats, big and small! 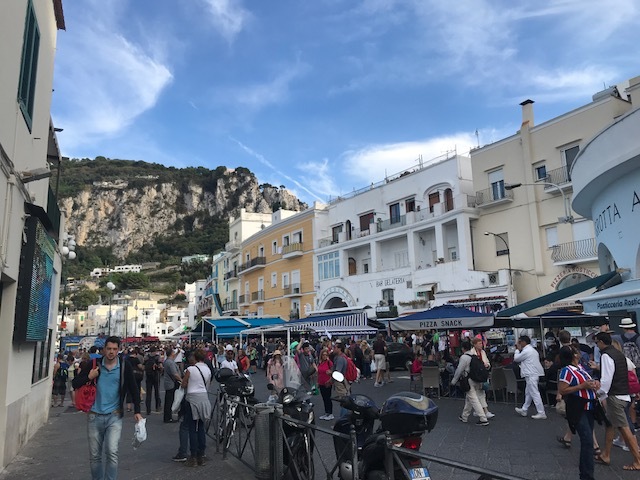 The first thing we did when we got there was try and find out how to get to the Blue Grotto. We ended up paying 14 euros and getting on a tour boat, which we thought would take us inside the Blue Grotto, and take us on a tour around the island. 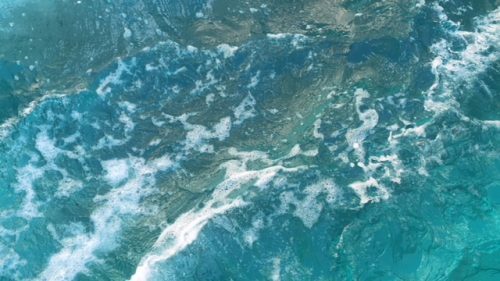 The boat motored out of the small harbor and into more open water, with the sun glinting off the surface like hundreds of ice crystals. The air that whipped by held only the faintest traces of salt, but I could feel it sticking to my sun-warmed skin. We passed by huge cliffs, other tour boats, and smaller, private ones. The guide pointed out major spots on the island, and we saw a few other grottos. They were small, and the tour boat would turn around and stick the back end, where we were sitting, in as far as it could go. The water was absolutely gorgeous, and was my favorite shade of blue. I’m grateful now for the opportunity to visit such a beautiful place! The bluest water I’ve ever seen. The most disappointing thing was not getting to go inside the Blue Grotto. 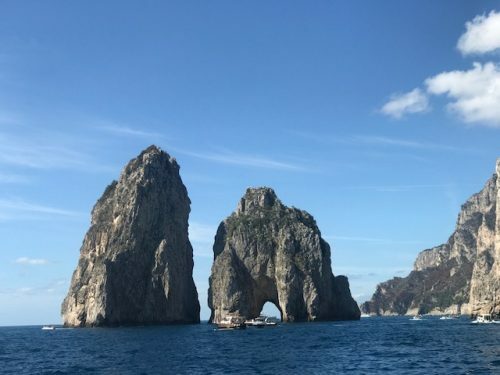 When the tour boat approached it, there were about eight other boats already there with passengers waiting to get in line for the rowboats that would enter the Blue Grotto. The guide told us that it would be a three hour wait, time that we didn’t have. So we went on our way with only a glimpse of the outside. Back on dry land, we made our way to the small rocky beach. I hadn’t brought my swimsuit, but two of my friends had so they jumped right into the water. I stood taking pictures of my surroundings, while my other two friends walked a little down the beach to a outcropping made of huge rocks. I was content just to stand with the air blowing around me, shaded by the trees behind me. The small, rocky beach where my friends swam. Andrew and Selena jumping in! We found lunch at a uncrowded little restaurant, one of many lining the touristy street. Three of my friends then had a ferry to catch to Sorrento, while my roommate, Audrey, and I stayed. We’d catch our ferry back to Naples at 6. In the hour we had left, we did our last minute shopping (I got a postcard and handmade sandals, and she got a sweatshirt) and got gelato from the place we’d been eyeing. The sun was now blocked by the island itself, so the port was in the shade, dropping the temperature a few degrees. It was still beautiful out, and I didn’t want to leave. 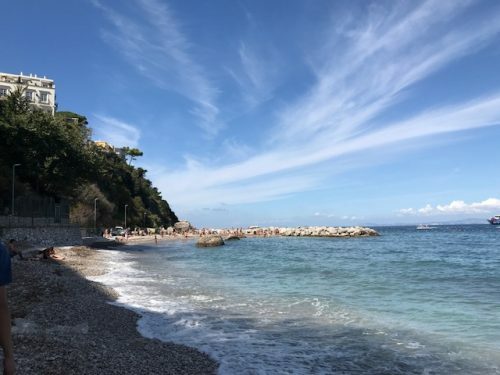 All in all, Capri is worth it. 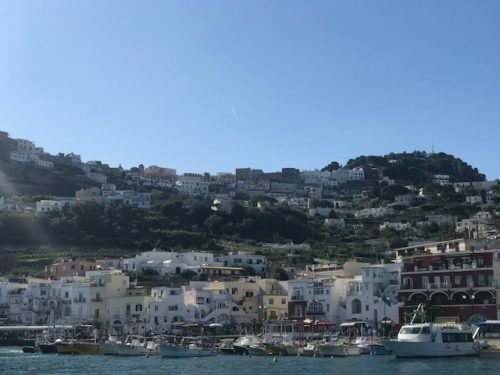 I had a great time, and although we didn’t get to go into the Blue Grotto or see much other than the port area of the island, it was worth getting up at 4am for. It’s a photographer’s dream, and so I was content. The port area with tourists galore.